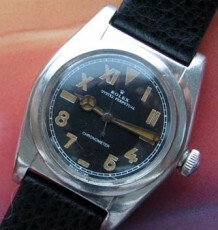 Vintage Rolex Prince doctors watch dating to the 1930’s. 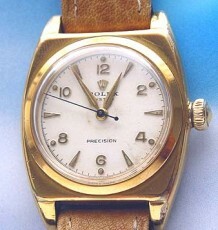 17 jewel Rolex prince movement in a flared yellow gold case reference 1490. 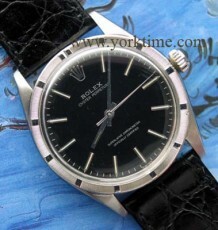 The Rolex Prince has long been considered the pinnacle of watchmaking since its introduction in the 1930’s. This flared case model is one of the most iconic models in the Prince lineup. 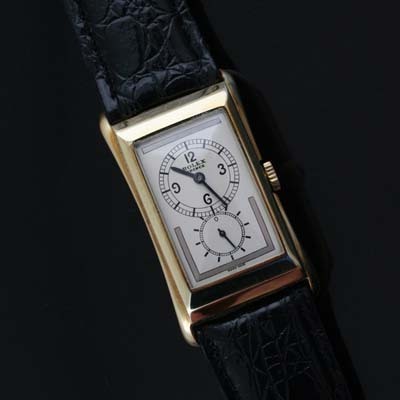 The case bears the reference number 1490 and is stamped and hallmark in 14 karat gold. The original Rolex 17 jewel movement is timed to 6 positions and features an over-sized balance wheel and the correct large balance guard across the bottom of the movement. The dial is made from solid silver and is prone to natural aging when the silver reacts with the paint used in the thirties. 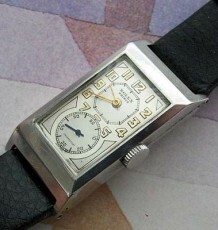 This one has been restored as per the original dies and is spectacular with the silver mirrored track outlining the seconds register at the bottom on the dial. The watch measures 24 mm wide by 42 mm long and is supplied on the buyers choice of a black or brown leather strap.